Gardens for Humanity’s mission is to develop and share our relationships with Humanity and Nature through gardening, art, and education. Founded in 1996, Gardens for Humanity has worked for ecological education to help give our children and all members of our community the values, tools and experiences needed to seek and regain balance with the natural world. 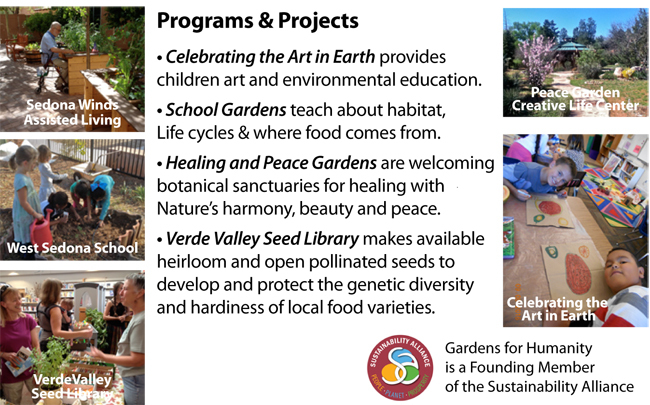 Our many Programs and Projects throughout the years have helped to enrich our Verde Valley area from personal wellness to schools and communities. Read more about what we do. Click on images below to learn more about the projects pictured. On Tuesday, April 16, we said farewell to our beloved founder and inspirational spirit, Adele Seronde. 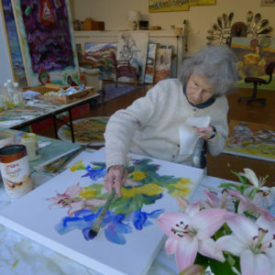 She left a bountiful legacy to all she touched, and will continue to cultivate beauty and love of Mother Earth in our consciousness, as we continue to work to nurture art and gardens. In this series, experts from the Sustainability Alliance will show you what you can do in your personal life to get toxic chemicals out of your home, reduce your waste and water use, improve your health, and save the planet all while building community. Brought to you by Gardens for Humanity, Cornucopia Community Advocates Food Recovery Program, Soil Harmonics and is hosted by Blue Apple Farm. Celebrate Earth Day, learn new skills and meet new people! 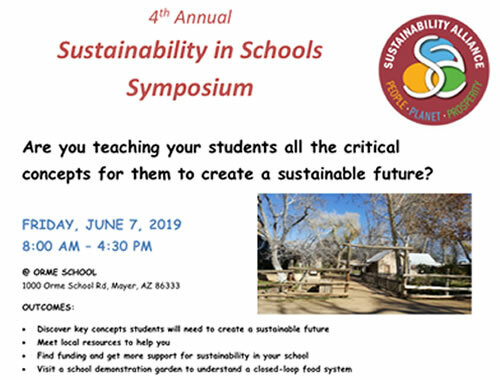 Join us on Saturday, April 20, 2019 for a series of Earth-inspired presentations, a hands-on composting workshop and a farm tour. This event is FREE TO ALL and Kid Friendly! Gardens for Humanity is a founding member of the Sustainability Alliance and co-organizer of the Symposium.